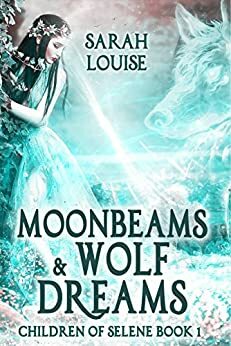 Moonbeams and Wolf Dreams the first in the Children of Selene by Sarah Lousie. 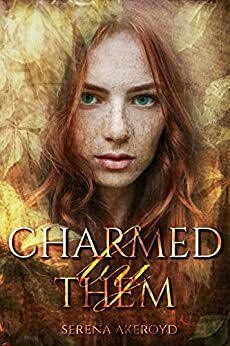 Aylin was found by her adopted fox shifter father in the hollowed out base of a large oak tree. She has forever been seen as prey in the pack she was raised in. The Alpha a nasty man that would sooner kill someone then ever help anyone. But soon it is time for Aylin’s first shift. Since she doesn’t know who her parents are, she has no idea what she could turn into for the first time. But that is the least of her worries. The Alpha has taken an interest in her, and Aylin does not reciprocate. He plans to take her after her first shift figuring that she will be easy prey as she acts like she is submissive. Aylin and her father have already created a plan to get her off of pack lands after her first shift on the moon after her 25th birthday. A nearby pack comes to attend the ceremony and as Aylin is blessed by Selene the shifter goddess, she turns into a large white wolf. Commotion breaks out and the Alpha of the visiting pack claims her as his mate (her wolf agrees) and an argument ensues as her current pack leader plans to use her might for his own. 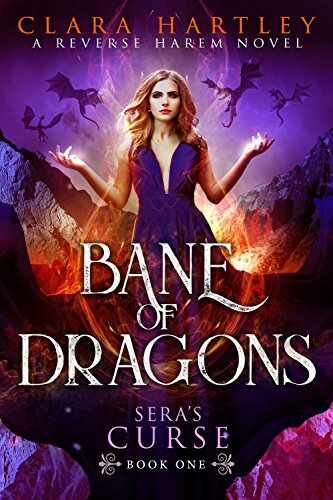 Bane of Dragons, Sera’s Curse book one. Written by Clara Hartley. Touching someone is something you do every day, only not for me. When I was nine I touched someone and he almost died. My touch gave him pain, excruciating pain. That is my curse and it is something I have to live with. If I touched someone with dragon blood they would feel the pain and everyone here has dagonblood, because I live in a world with dragons. My curse made my family cursed too and I was shunned away, even my own family hates me. And there is nothing I can do about, except getting their respect, working hard and make sure I’m never being shunned again. So I need to be someone important someone that people will look up to. A vote that would change everything was coming up and I need to do anything to win it. Everything seems to go great and I’m finally happy. Until I walked into the four hidrae princes, dragon-shifters of the most powerful kind and my touch doesn’t harm them. After so many years not touching someone their touch is intoxicating. Now I need to choose because being associated with them can ruin all my changes on winning. Only those princes, they keep drawing me back, I can’t get rid of them and maybe I don’t want to. 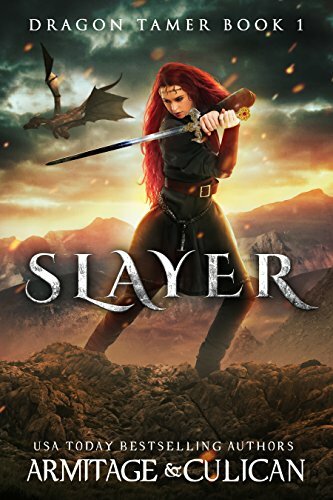 Slayer, the first in the Dragon Tamer series J.A. Culican and J.A. Armitage. Julianna has been raised her whole life to be a dragon slayer. Everyone in her village and her family have all been raised to be hunters. In their village they live below a mountain that they have to climb in order to locate the dragons that could put their village and way of life at risk. Julianna has been practicing for the last year in secret after her brother turned 18 and was given his armour and sword. Julianna took one of the training swords and taught herself to fight watching her brother be trained by their father. 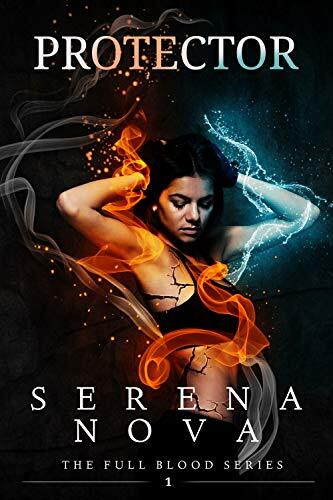 Julianna in her first fight against her brother bests him and after only a day of training while her brother took months before he was ready is sent with her father on her first hunt. While hiking up the mountain hunting her first dragon, Julianna notices that there is something different about the red dragon flying over head and Julianna can’t kill it after thinking that it is just protecting an egg. When she stumbles and falls off the side of the cliff and the dragon swoops down and rescues Julianna. Marked the first in the Last Princess by A.M. Hardin. Cherish is almost 18 and in that whole time has considered herself pretty normal. But as her birthday has drawn closer she has started to seeing glimmers around people. But with three months left in school, three new students enroll. Cherish is having issues with her boyfriend. He has decided that he doesn’t want to be with Cherish anymore, but seems to have forgotten to tell her. The three guys are some of the most handsome that anyone at school has seen. Those three guys have a secret of their own. The guys are meant to protect Cherish. They have been looking for her knowing that her 18th birthday was coming up. They are there to stop anyone from hurting her. The guys start focusing on Cherish, much to the disappointment of the other girls at school. But after being attacked at prom, Cherish learns the secret that the guys have been holding on to. Cherish is the last Elvin princess and her father is looking for her. But Cherish doesn’t really believe them. Can she come to terms with all that she is learning about her new life and what is going on with her? 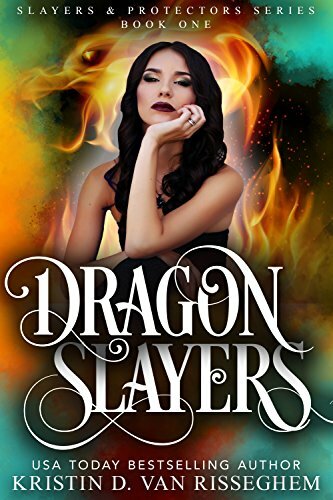 Dragon Slayers the first in the Slayers and Protectors series by Kristin D. Van Risseghem. Brooklyn has been at Slayer school for 11 months and today is the graduation hunt. She hasn’t gone out of her way to make friends and figures it’s because of the amount of money her parents have and that they are high ranking members on the council. Brooklyn accidentally wanders off on the hunt and comes face to face with a large black dragon where year three student Manny comes to her aid. After fleeing and regrouping with the other year ones, Brooklyn is the last one with a weapon. Though hesitating to kill the dragon, she finally takes the kill shot earning her a reputation among the first years and the other students. This causes her to become more popular and gets her a best friend in Noelle. At the same time Manny tells Brooklyn of his interest in her and that he can now pursue her as she is no longer a year one. In starting year two with such a large staff the new year twos are broken into three groups each supervised by the top third year students. Manny, Bronx and Staten take the different students and Brooklyn ends up with Bronx who is an uncontrollable flirt and makes the moves on Brooklyn even knowing that she is dating Manny.